Katon Dawson is re-emerging as a leading Republican figure ahead of an important RNC gathering later this month. Washington (CNN) - With GOP infighting reaching a crescendo after the latest string of off-message comments from Republican National Committee chairman Michael Steele, the man who narrowly lost to Steele in last year's contentious race for the chairmanship is re-emerging ahead of an important RNC gathering later this month. Katon Dawson, the former South Carolina Republican Party chairman who lost to Steele by just 14 votes in last February's RNC election, will travel to the committee's Winter Meeting in Hawaii on Jan. 25 in the place of Karen Floyd, the current South Carolina GOP chairwoman. Floyd asked Dawson to make the trip in her stead because the RNC confab conflicts with a Republican gubernatorial debate in South Carolina. Dawson told CNN he is "thrilled" to travel to the Winter Meeting in Honolulu so he can re-connect with "a lot of really good friends and associates" on the committee. Since coming up short in the RNC race, Dawson - who helmed the South Carolina GOP for seven years - has been running his Columbia-based auto parts business. He also recently started Dawson Public Affairs, a political consulting firm. Though the trip raises suspicions that he could be maneuvering behind the scenes to replace Steele in the next chairman's race, Dawson said it would be "unfortunate" for political observers to read too much into the excursion. "I certainly understand how someone would see it that way, but that is not the intent of why I am going," he said. "I am going to reconnect wth my Republican colleagues around the country. I am as engaged as I was when I was state party chairman and when I was running for national chairman." But pressed on whether he wants another shot at running the party, Dawson would not rule it out. "I am 53 years young, and I have done politics all my life," he said. "I have learned to never to close or open any doors at any point, so it would be hard to answer that question." Dawson also offered a mix of praise and criticism for Steele, saying he has been "very supportive" of the current chairman. "I have respectfully declined to make some public comments because our leadership styles are very different," he said. Steele has been under fire this week for predicting that Republicans will not take back the House this November, a remark that angered party strategists on Capitol Hill. Dawson said he understood that Steele was trying to set appropriate expectations, but added that he would have expressed himself differently. "Michael Steele does have a different style, whether it's offensive or to be applaued," he said. "Would have I have said it? Probably not. But what I will say is political parties are judged by wins and loses and setting expectations. And you have to very careful about what expectations you set." 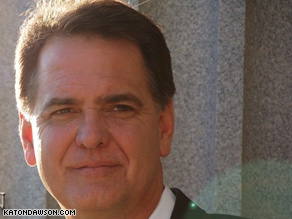 Dawson said Republicans "will come very close to taking a majority" this fall. Cynthia@calls me all kinds of names and degrades and demeans me and then wonders why I am so negative about liberals. That is the thing about TEA party that liberals don't get. They degrade and demean those who disagree with them and are so stupid they don't think there will be a reaction. There is and a bigger one is coming in 2010. How can any democrat breathe until non union people are given jobs? 45,000 deaths a year for those without health care is OK, as long big insurance will support the GOP, since those who die cannot vote. Our plan for illegal immigration is to take over in Washington DC, and drive the country to a great depression. The illegals will all leave because they will be able to get higher paid jobs in Canada and Mexico.